This is the memory of an enlightened Pastor who led the diocese of Trani-Barletta-Bisceglie, as well as the Association Luisa Piccarreta in Corato: Archbishop Carmelo Cassati whom the Lord called to His house. He was Pastor and father for ten years, for the children of the Divine Will who remember him as paternal guide, wise and at the same time of holy prudence. 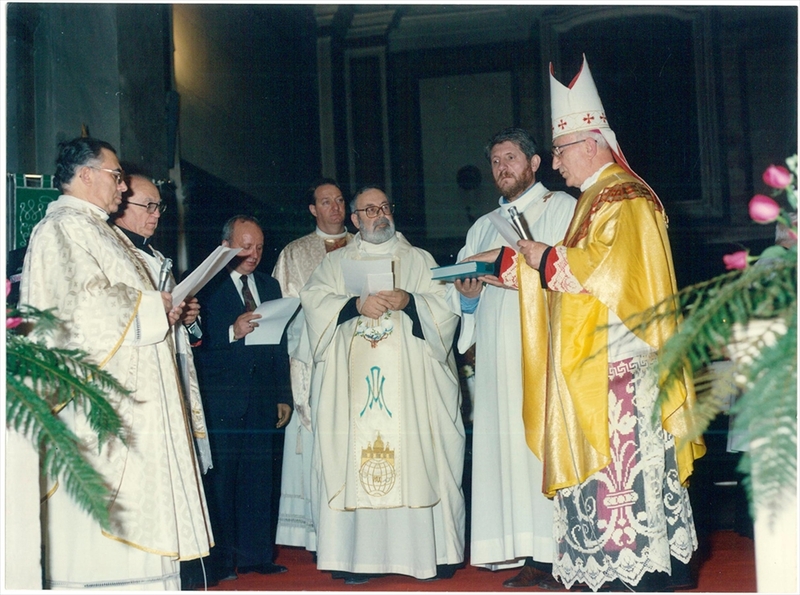 After two months from his entry into the diocese, Archbishop Cassati, on April 10, 1991, made his first visit to the Association Luisa Piccarreta. After visiting the chapel and adoring the Most Blessed Sacrament he visited Luisa's room and prayed at her bedside. After a dialogue with the members he celebrated the Eucharist in the chapel of the association, which was recently restored, and promised to return soon and often. So it was that on the 25th of every month he concluded that day of adoration with the Eucharistic blessing. Having received from the Holy See the "Not obstare" at the request of the Association, on November 20, 1994 he began the diocesan process for the cause of beatification and canonization of the Servant of God Luisa Piccarreta in the Mother Church, the presence of many faithful also from different parts of the world. A small excerpt of his homily: "Luisa is not a saint like any other. She is a saint who was put on the cross and that's because she could resemble Christ Crucified who had asked her to join Him in His Passion. Even though Luisa was born, died and was buried in Corato, you can not explain why in some countries people Know and love her more. To understand Luisa we must go only to one point: "FIAT! Your Will be done. " We have no choice. This meant her entire life. " Archbishop Cassati never missed an opportunity to spread the figure of Luisa and manifest the importance of her writings. In 1995 he made the journey to America, Costa Rica, to open the 1st international conference with the participation of 17 nations. From Corato some priests and Sister Assunta left together with the Archbishop. The presence of the Archbishop of Trani gave a favorable impression to the figure of Luisa in distant lands. His exact words: "I was pleased to see those souls who welcomed with humility the message of the Divine Will". He promoted the message of Luisa at the Congregation of the Faith, and thanks to him, the Association obtained the writings of Luisa photocopied. To him we owe the gift of this treasure that is, Luisa’s Diary that describes the transformation of men’s lives into the life of heaven even while we are on earth. March 4,1947 -1997: 50th anniversary of the death of Luisa. The commitment and participation of Archbishop Cassati was an example for the city of Corato and the many pilgrims who came from foreign nations. At the invitation of the Archbishop there was the participation of all the clergy of Corato and many priests of the diocese. Finally, he issued an edict in which he asked all those who possessed manuscripts and things that had belonged to Luisa to donate them to the Association to be well kept and give the right value to them. It was an edict which gave positive results. A brief excerpt of the homily of March 4, 1997 on the occasion of the 50th anniversary of Luisa’s death: "Fifty years ago for several days the body of Luisa Piccarreta passed throughout Corato. The testimony of this evening suggests that her name is still alive among you and I would like it to be alive even in the whole diocese, because it is a glory for Corato but it is also a glory of the diocese. I wish that all of us could start to fall in love with this figure, meditating a little of her life. " During those ten years lived among us, the Archbishop strengthened his paternal relationship and an authority that invited us to trust and filial confidence. So the Association Luisa Piccarreta reminds us of him. Thanks to the Lord who chooses the Pastors according His own heart, so that the Church is ever more dedicated to raising Its children in imitation of Jesus the King, so that the Kingdom of the Fiat Voluntas Tua can have its fulfillment "as in heaven, so on earth".